Find out about the Kāhui Raukura Reo Māori Alumni community of graduates from the Huarahi Māori specialisation at the Faculty of Education and Social Work and other related programmes throughout the University of Auckland. At the Huarahi Māori 21st anniversary celebrations in 2017 more than 280 people honoured the past and celebrated the future with the launch of the Kāhui Raukura Reo Māori Alumni community. The Faculty of Education and Social Work’s Huarahi Māori specialisation is one of three specialisations in the Bachelor of Education (Teaching). It’s designed for speakers of te reo Māori who want to work as primary teachers educating students by using the Māori-medium in kura, immersion and bilingual schools and classrooms. 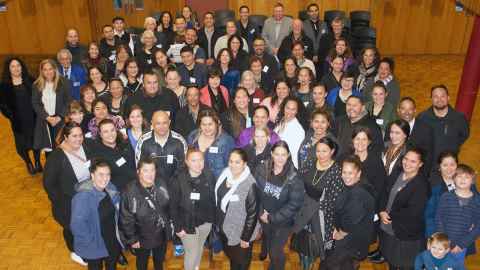 Te Puna Wānanga, the faculty’s School of Māori and Indigenous Education, is leading a strategy that aims to grow the Kāhui Raukura Reo Māori Alumni community. It is working to build an engaged and enthusiastic alumni community that connects and promotes the regeneration of te reo Māori across the University. Watch this video from Māori TV about the celebration of 21 years of Huarahi Māori.